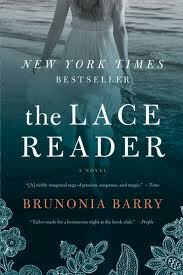 Initially, I was interested in The Lace Reader by Brunonia Barry because it’s the success story of a self-published author making it into the big time, and a two million dollar contract. In doing my research for this post to get the particulars, I came upon an NPR story that aired back in 2008. According to that piece, Ms. Barry and her husband thought they could publish the book themselves, since they had a company which published games, but found that the game experience, while helpful, wasn’t exactly the same. The book is set in Salem so they started locally there, and gained support from local book stores, who recommended The Lace Reader to book clubs nearby. The first two clubs got printed pages of the book in boxes, as none had been printed yet, and the book clubs were encouraged to respond with feedback. Eventually they printed 2000 copies, word of mouth spread to book clubs all over the country and the local bookstores talked the book up and helped them make important contacts in the publishing world. This led them to a publicist who got the book to the influential Publishers Weekly, and the book got a good review. Once that happened, a Ms. Rebecca Oliver happened on the scene, a literary agent with a somewhat snarky manner and a disgusting Valley Girl accent. “When one thinks of self-published, there’s a sort of a whole, UHHM, idea of what self-published means and that’s that the author has probably tried to sell the book previously to New York publishers and they’re selling it out of the trunk of their car now. And you assume there is a certain quality to the work.” I wonder if Ms. Oliver has changed her mind, as a few years have gone by since she said this and, as we know, the self-publishing world has evolved just a bit since then, and many agents are looking for other ways to make a living. I wish there were a way to get that VG accent onto paper. The growly, twanginess and that cute little uplift at the end of the sentence, which makes it, like, a question? Supposedly, the book has “the kind of plot twists that readers like to dissect”. Yes. That the book has a “very compelling ending”. No. I beg to disagree. The ending has been described by some to rival The Sixth Sense. Remember that one, where Bruce Willis finally realizes he is dead and neither he (nor the audience) had known that before? It worked, but it was a stretch. Well, this novel’s ending is a real stretch and it doesn’t work. I am frankly amazed that it can be described as “compelling”. To me, it was contrived and unbelievable. Yes, I know. It’s fiction. But still. I liked the book mostly, the editing was perfect. It started on a somewhat funny note, a nice hook, which I always appreciate. The characters were not perfect people, which I also liked, but the mystery surrounding the drowning death of one woman, and the disappearance of another, while compelling, was resolved in a ho-hum sort of way. The real clincher came very near the end, and I nearly threw the book away at that point. There were pretty, almost poetic lines at the beginning of each chapter, about the lace and how it could be read, which I liked. There were characters who didn’t need to be in the story at all, which I didn’t like. I’ll do the Page 99 test on this book and find something I liked and something I didn’t. This page happens to be the first page of Chapter 11. I like the blurb at the beginning of the chapter, it is well-written. The half page of text contains short, choppy sentences. I lot of “I did this and then I did that” – Hemingwayesque, without the distinctive writing style. The book is written in first person present tense, very difficult for an inexperienced author to do, but I thought this was done well. I liked it well enough, I had started it once, got halfway through and shelved it before taking it up again and starting over. It was a compelling enough read for the most part, but the ending blew it for me. This entry was posted in Book Reviews and tagged baby boomer fiction, book review, Brunonia Barry, The Lace Reader, women's fiction by Lynn Schneider. Bookmark the permalink. It stinks to not like the ending of a book you’ve invested time in. But it sounds like an interesting read. This author’s example just goes to show how important word of mouth is in marketing a book. Of course, that assumes a good product. If the product is poor, then word of mouth will have the opposite effect from what’s desired. It would appear she did it right. It was not a bad novel. The writing was excellent, so it was just the ending that blew it for me. I was interested in it because it was initially self-published. Belle, this is, indeed, an honor. See how I did that? Put that “indeed” in there? That’s how they talk over here in London. I will be back stateside in a little over a week and will check this out! Thank you! Very detailed and interesting review, Lynn, but the author might cringe at a few of the critical but fair comments. Good job. Ihave a tremendous amount of admiration for you for doing this literary work. Hi John, I am glad to hear from you. I have gotten a few replies from authors when reviewing their books, but not often. Luckily, those reviews were all good ones!